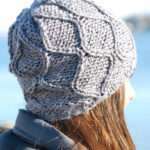 To work this pattern in the round, such as for a hat, use the Repeating Pattern Rows chart, and make sure to read it from right to left for each row, rather than alternating sides each time. 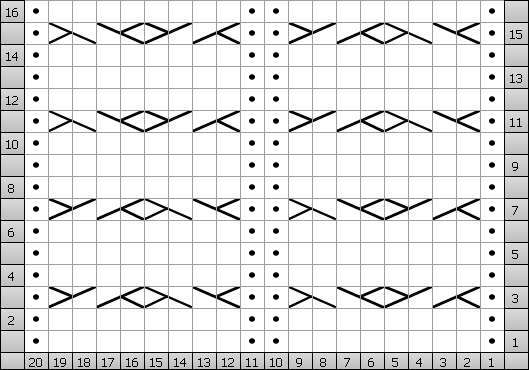 Also, cast onto your loom in a clockwise direction, using a number of pegs that is divisible by 10 for repeats of the same column, or 20 for repeats of the 2 alternating columns. 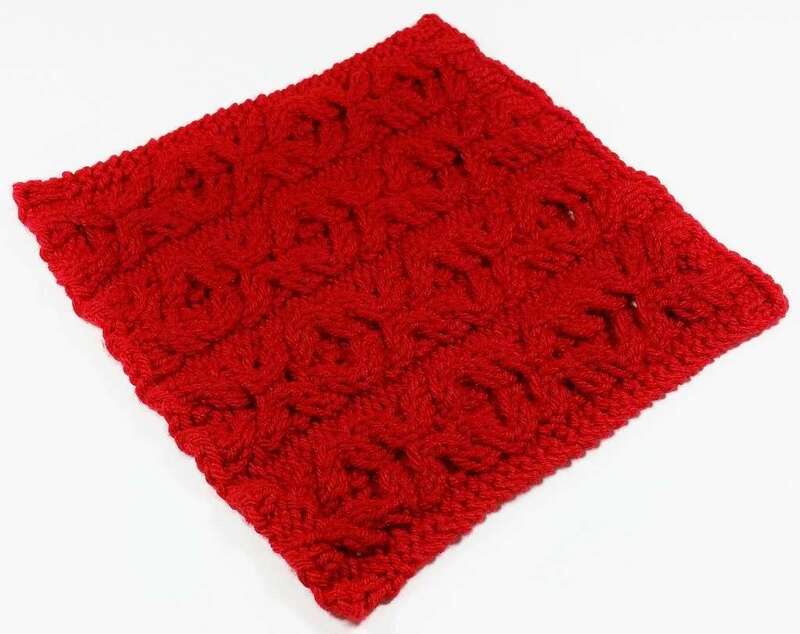 For flat pieces of a greater size, simply increase the number of Repeating Pattern Rows inside the garter stitch edges for the length and width required, then complete with the Finishing Rows. The border edges may need to also be increased to coordinate with the number of increased Repeating Pattern Rows. 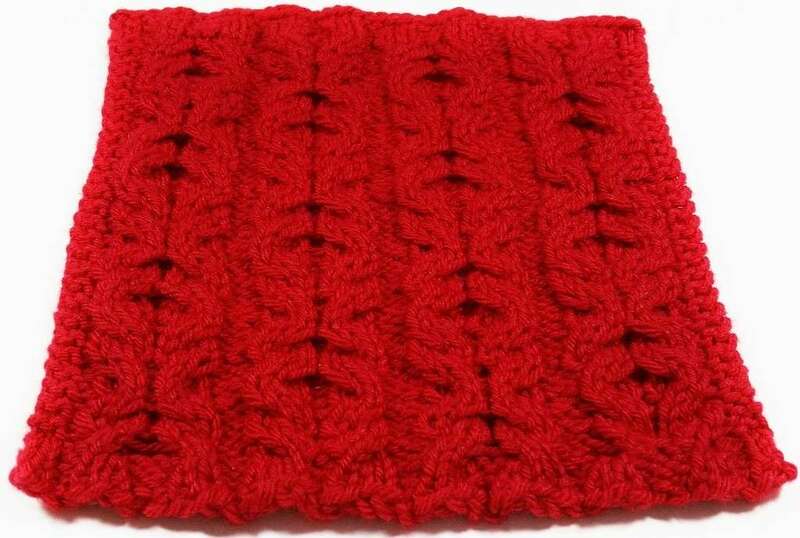 When the pattern uses the term “knit” or “k”, please use the true knit stitch or the u-stitch, not the e-wrap…except in the row before working the cables, as noted below. 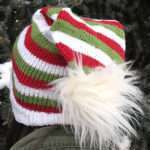 *Note: It helps to e-wrap the knit stitches that sit right in line with the cable pegs in the row before the cable row to aid the cable stitches in stretching to their new places. Simply untwist the e-wrap loops when creating the cables. Move the 2 stitches on the left of the designated cable pegs over 2 pegs to the right. 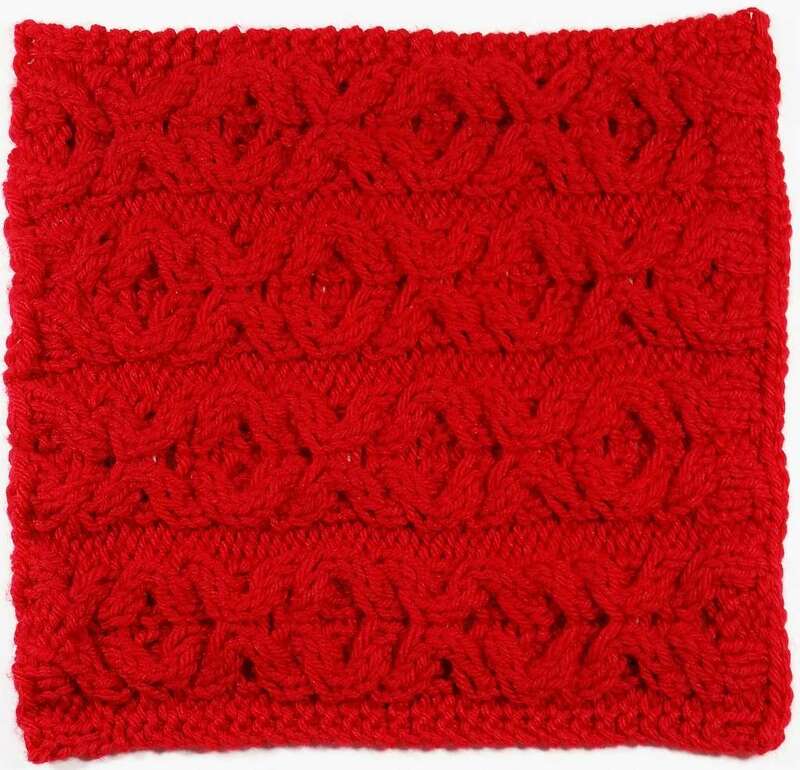 Knit the 2 stitches you’ve just moved. Place the stitches from the cable needle onto the now empty left pegs and knit them. Pull out any slack from all 4 sts before moving on. Move the 2 stitches on the right of the designated cable pegs over 2 pegs to the left. 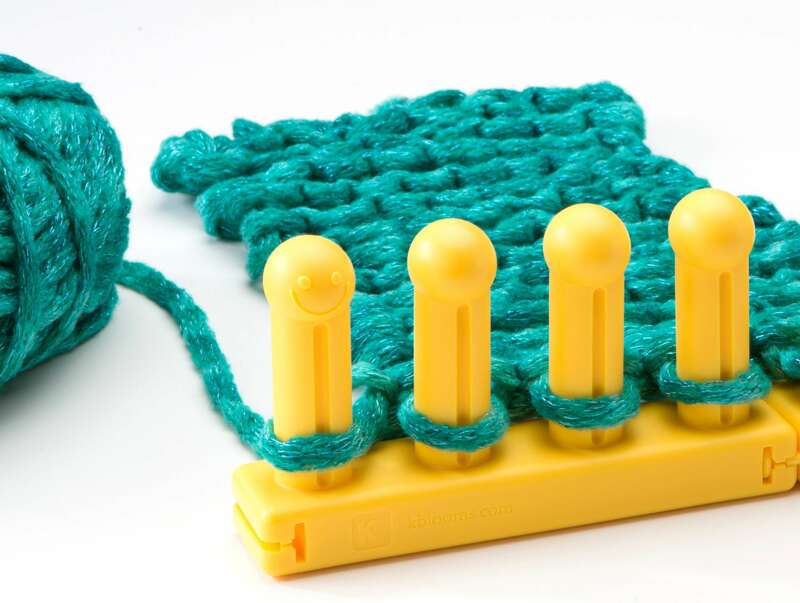 Place the stitches from the cable needle onto the now empty right pegs and knit them. Knit the 2 stitches on the left. Pull out any slack from all 4 sts before moving on. Rows 1 & 2: p1, k8, p2, k8, p1. Row 3: p1, 2/2RC, 2/2LC, p2, 2/2LC, 2/1RC, p1. Rows 4-6: rep Row 1. Rows 8-10: rep Row 1. Row 11: p1, 2/2LC, 2/2RC, p2, 2/2RC, 2/1LC, p1. Rows 12-14: rep Row 1. Row 15: rep Row 11. Row 16: rep Row 1. Rows 1-4: k2, p2, k2, p3, k2, [p2, k3, p2, k3] rep between [ ] once, p2, k2, p3, k2, p2, k2. Row 5: k2, p1, *k8, p2, rep from * twice more, k8, p1, k2. Row 6: p3, *k8, p2, rep from * twice more, k8, p3. 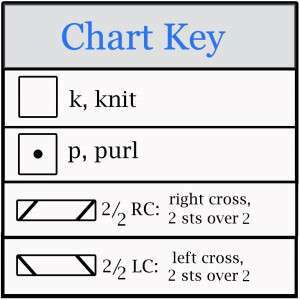 Row 7: k2, p1, *2/2RC, 2/2LC, p2, 2/2LC, 2/1RC, p2, rep from * to last 3 sts, p1, k2. Rows 12-14: rep Rows 8-10. Row 15: k2, p1, *2/2LC, 2/2RC, p2, 2/2RC, 2/1LC, p2, rep from * to last 3 sts, p1, k2. Rows 16-18: rep Rows 8-10. Row 19: rep Row 15. Row 20: rep Row 8. 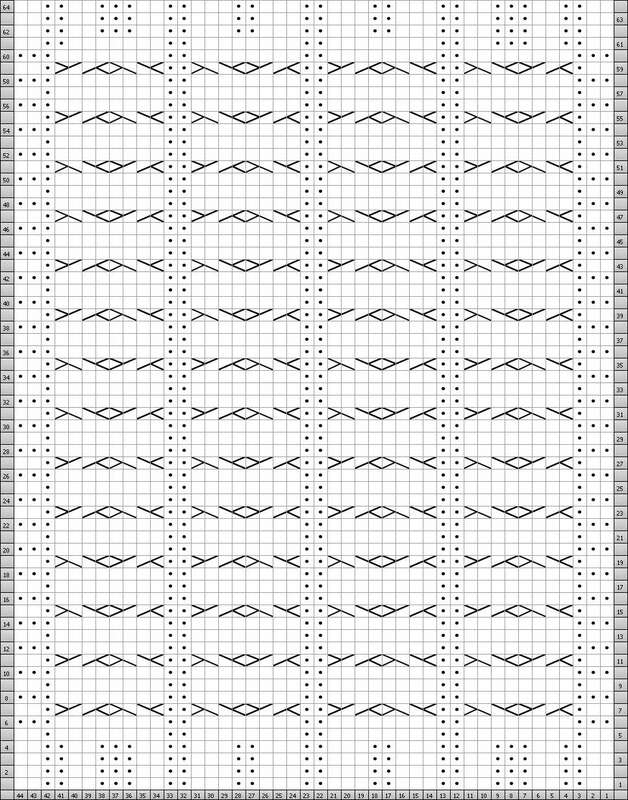 Row 21-60: Repeat Rows 5-20. Rows 61-64: k2, p2, k2, p3, k2, [p2, k3, p2, k3] rep between [ ] once, p2, k2, p3, k2, p2, k2. Block well to an 8” x 8” measurement.